As of March 1st, 2018, 3,741 exoplanets have been confirmed in 2,794 systems, with 622 systems having more than one planet. Most of the credit for these discoveries goes to the Kepler space telescope, which has discovered roughly 3500 planets and 4500 planetary candidates. In the wake of all these discoveries, the focus has shifted from pure discovery to research and characterization. In this respect, planets detected using the Transit Method are especially valuable since they allow for the study of these planets in detail. For example, a team of astronomers recently discovered three Super-Earths orbiting a star known GJ 9827, which is located just 100 light years (30 parsecs) from Earth. The proximity of the star, and the fact that it is orbited by multiple Super-Earths, makes this system ideal for detailed exoplanet studies. The study, titled “A System of Three Super Earths Transiting the Late K-Dwarf GJ 9827 at Thirty Parsecs“, recently appeared online. The study was led by Joseph E. Rodriguez of the Harvard-Smithsonian Center for Astrophysics and included members from The University of Texas at Austin, Columbia University, the Massachusetts Institute of Technology, and the NASA Exoplanet Science Institute. As with all Kepler discoveries, these planets were discovered using the Transit Method (aka. Transit Photometry), where stars are monitored for periodic dips of brightness. These dips are the result of exoplanets passing in front of the star (i.e. transiting) relative to the observer. While this method is ideal for placing constraints on the size and orbital periods of a planet, it can also allow for exoplanet characterization. Basically, scientists are able to learn things about their atmospheres by measuring the spectra produced by the star’s light as it passes through the planet’s atmosphere. Combined with radial velocity measurements of the star, scientists can also place constraints on the planet’s mass and radius and can determine things about the planet’s interior structure. Another interesting thing about these super-Earths is how their short orbital periods – which are 1.2, 3.6 and 6.2 days, respectively – would result in fairly hot temperatures. In short, the team estimates that the three super-Earths experience surface temperatures of 1172 K (899 °C; 1650 °F), 811 K (538 °C; 1000 °F), and 680 K (407 °C; 764 °F), respectively. By comparison, Venus – the hottest planet in the Solar System – experiences surface temperatures of 735 K (462 °C; 863 °F). So while temperatures on Venus are hot enough to melt lead, conditions on GJ 9827 b are almost hot enough to melt bronze. The light curve obtained during Campaign 12 of the K2 mission of the GJ 9827 system. Credit: Rodriguez et al., 2018. However, the most significant thing about this discovery is the opportunities it could provide for exoplanet characterization. At just 100 light-years from Earth, it will be relatively easy for the next-generation telescopes (such as the James Webb Space Telescope) to conduct studies of their atmospheres and provide a more detailed picture of this system of planets. In the hunt for extra-terrestrial life, scientists tend to take what is known as the “low-hanging fruit approach”. This consists of looking for conditions similar to what we experience here on Earth, which include at oxygen, organic molecules, and plenty of liquid water. Interestingly enough, some of the places where these ingredients are present in abundance include the interiors of icy moons like Europa, Ganymede, Enceladus and Titan. Whereas there is only one terrestrial planet in our Solar System that is capable of supporting life (Earth), there are multiple “Ocean Worlds” like these moons. Taking this a step further, a team of researchers from the Harvard Smithsonian Center for Astrophysics (CfA) conducted a study that showed how potentially-habitable icy moons with interior oceans are far more likely than terrestrial planets in the Universe. The study, titled “Subsurface Exolife“, was performed by Manasvi Lingam and Abraham Loeb of the Harvard Smithsonain Center for Astrophysics (CfA) and the Institute for Theory and Computation (ITC) at Harvard University. For the sake of their study, the authors consider all that what defines a circumstellar habitable zone (aka. “Goldilocks Zone“) and likelihood of there being life inside moons with interior oceans. To begin, Lingam and Loeb address the tendency to confuse habitable zones (HZs) with habitability, or to treat the two concepts as interchangeable. For instance, planets that are located within an HZ are not necessarily capable of supporting life – in this respect, Mars and Venus are perfect examples. Whereas Mars is too cold and it’s atmosphere too thin to support life, Venus suffered a runaway greenhouse effect that caused it to become a hot, hellish place. On the other hand, bodies that are located beyond HZs have been found to be capable of having liquid water and the necessary ingredients to give rise to life. In this case, the moons of Europa, Ganymede, Enceladus, Dione, Titan, and several others serve as perfect examples. Thanks to the prevalence of water and geothermal heating caused by tidal forces, these moons all have interior oceans that could very well support life. As such, Lingam and Loeb widen their consideration of habitability to include worlds that could have subsurface biospheres. Such environments go beyond icy moons such as Europa and Enceladus and could include many other types deep subterranean environments. On top of that, it has also been speculated that life could exist in Titan’s methane lakes (i.e. methanogenic organisms). However, Lingam and Loeb chose to focus on icy moons instead. Ultimately, Lingam and Loeb chose to focus on worlds that would orbit stars and likely contain subsurface life humanity would be capable of recognizing. They then went about assessing the likelihood that such bodies are habitable, what advantages and challenges life will have to deal with in these environments, and the likelihood of such worlds existing beyond our Solar System (compared to potentially-habitable terrestrial planets). For starters, “Ocean Worlds” have several advantages when it comes to supporting life. Within the Jovian system (Jupiter and its moons) radiation is a major problem, which is the result of charged particles becoming trapped in the gas giants powerful magnetic field. Between that and the moon’s tenuous atmospheres, life would have a very hard time surviving on the surface, but life dwelling beneath the ice would fare far better. In the end, Lingam and Loeb determined that a wide range of worlds with ice shells of moderate thickness may exist in a wide range of habitats throughout the cosmos. Based on how statistically likely such worlds are, they concluded that “Ocean Worlds” like Europa, Enceladus, and others like them are about 1000 times more common than rocky planets that exist within the HZs of stars. This study also serves as a reminder that as humanity explores more of the Solar System (largely for the sake of finding extra-terrestrial life) what we find also has implications in the hunt for life in the rest of the Universe. This is one of the benefits of the “low-hanging fruit” approach. What we don’t know is informed but what we do, and what we find helps inform our expectations of what else we might find. And of course, it’s a very vast Universe out there. What we may find is likely to go far beyond what we are currently capable of recognizing! In today’s modern, fast-paced world, human activity is very much reliant on electrical infrastructure. If the power grids go down, our climate control systems will shut off, our computers will die, and all electronic forms of commerce and communication will cease. But in addition to that, human activity in the 21st century is also becoming increasingly dependent upon the infrastructure located in Low Earth Orbit (LEO). Aside from the many telecommunications satellites that are currently in space, there’s also the International Space Station and a fleet of GPS satellites. It is for this reason that solar flare activity is considered a serious hazard, and mitigation of it a priority. Looking to address that, a team of scientists from Harvard University recently released a study that proposes a bold solution – placing a giant magnetic shield in orbit. The study – which was the work of Doctor Manasavi Lingam and Professor Abraham Loeb from the Harvard Smithsonian Center for Astrophysicist (CfA) – recently appeared online under the title “Impact and Mitigation Strategy for Future Solar Flares“. As they explain, solar flares pose a particularly grave risk in today’s world, and will become an even greater threat due to humanity’s growing presence in LEO. Solar flares have been a going concern for over 150 years, ever since the famous Carrington Event of 1859. Since that time, a great deal of effort has been dedicated to the study of solar flares from both a theoretical and observational standpoint. And thanks to the advances that have been made in the past 200 years in terms of astronomy and space exploration, much has been learned about the phenomena known as “space weather”. At the same time, humanity’s increased reliance on electricity and space-based infrastructure have also made us more vulnerable to extreme space weather events. In fact, if the Carrington event were to take place today, it is estimated that it would cause global damage to electric power grids, satellites communications, and global supply chains. The cumulative worldwide economic losses, according to a 2009 report by the Space Studies Board (“Severe Space Weather Events–Understanding Societal and Economic Impacts”), would be $10 trillion, and recovery would take several years. And yet, as Professor Loeb explained to Universe Today via email, this threat from space has received far less attention than other possible threats. Artist’s concept of a large asteroid passing by the Earth-Moon system. Credit: A combination of ESO/NASA images courtesy of Jason Major/Lights in the Dark. To address this, Lingham and Loeb developed a simple mathematical model to assess the economic losses caused by solar flare activity over time. This model considered the increasing risk of damage to technological infrastructure based on two factors. For one, they considered the fact that the energy of a solar flares increases with time, then coupled this with the exponential growth of technology and GDP. To address this growing risk, Lingham and Loeb also considered the possibility of placing a magnetic shield between Earth and the Sun. This shield would be placed at the Earth-Sun Lagrange Point 1, where it would be able to deflect charged particles and create an artificial bowshock around Earth. In this sense, this shield would protect Earth’s in a way that is similar to what its magnetic field already does, but to greater effect. Based on their assessment, Lingham and Loeb indicate that such a shield is technically feasible in terms of its basic physical parameters. They were also able to provide a rudimentary timeline for the construction of this shield, not to mention some rough cost assessments. As Loeb indicated, such a shield could be built before this century is over, and at a fraction of the cost of what would be incurred from solar flare damage. Interestingly enough, the idea of using a magnetic shield to protect planets has been proposed before. For example, this type of shield was also the subject of a presentation at this year’s “Planetary Science Vision 2050 Workshop“, which was hosted by NASA’s Planetary Science Division (PSD). This shield was recommended as a means of enhancing Mars’ atmosphere and facilitating crewed mission to its surface in the future. During the course of the presentation, titled “A Future Mars Environment for Science and Exploration“, NASA Director Jim Green discussed how a magnetic shield could protect Mars’ tenuous atmosphere from solar wind. This would allow it to replenish over time, which would have the added benefit of warming Mars up and allowing liquid water to again flow on its surface. If this sounds similar to proposals for terraforming Mars, that’s because it is! Beyond Earth and the Solar System, the implications for this study are quite overwhelming. In recent years, many terrestrial planets have been found orbiting within nearby M-type (aka. red dwarf) star systems. Because of the way these planets orbit closely to their respective suns, and the variable and unstable nature of M-type stars, scientists have expressed doubts about whether or not these planets could actually be habitable. In short, scientists have ventured that over the course of billions of years, rocky planets that orbit close to their suns, are tidally-locked with them, and are subject to regular solar flares would lose their atmospheres. In this respect, magnetic shields could be a possible solution to creating extra-solar colonies. Place a large shield in orbit at the L1 Lagrange point, and you never have to worry again about powerful magnetic storms ravaging the planet! It is a foregone conclusion that as time and technology progress, humanity’s presence in (and reliance on) space will increase. As such, preparing for the most drastic space weather events the Solar System can throw at us just makes sense. And when it comes to the big questions like “are we alone in the Universe?”, it also makes sense to take our boldest concepts and proposals and consider how they might point the way towards extra-terrestrial intelligence. For centuries, astronomers have been looking beyond our Solar System to learn more about the Milky Way Galaxy. And yet, there are still many things about it that elude us, such as knowing its precise mass. Determining this is important to understanding the history of galaxy formation and the evolution of our Universe. As such, astronomers have attempted various techniques for measuring the true mass of the Milky Way. So far, none of these methods have been particularly successful. However, a new study by a team of researchers from the Harvard-Smithsonian Center for Astrophysics proposed a new and interesting way to determine how much mass is in the Milky Way. By using hypervelocity stars (HVSs) that have been ejected from the center of the galaxy as a reference point, they claim that we can constrain the mass of our galaxy. Their study, titled “Constraining Milky Way Mass with Hypervelocity Stars“, was recently published in the journal Astronomy and Astrophysics. The study was produced by Dr. Giacomo Fragione, an astrophysicist at the University of Rome, and Professor Abraham Loeb – the Frank B. Baird, Jr. Professor of Science, the Chair of the Astronomy Department, and the Director of the Institute for Theory and Computation at Harvard University. To be clear, determining the mass of the Milky Way Galaxy is no simple task. On the one hand, observations are difficult because the Solar System lies deep within the disk of the galaxy itself. But at the same time, there’s also the mass of our galaxy’s dark matter halo, which is difficult to measure since it is not “luminous”, and therefore invisible to conventional methods of detection. For the sake of their study, Prof. Loeb and Dr. Fragione therefore chose to take a novel approach, which involved modeling the motions of HVSs to determine the mass of our galaxy. More than 20 HVSs have been discovered within our galaxy so far, which travel at speeds of up to 700 km/s (435 mi/s) and are located at distances of about 100 to 50,000 light-years from the galactic center. These stars are thought to have been ejected from the center of our galaxy thanks to the interactions of binary stars with the supermassive black hole (SMBH) at the center of our galaxy – aka. 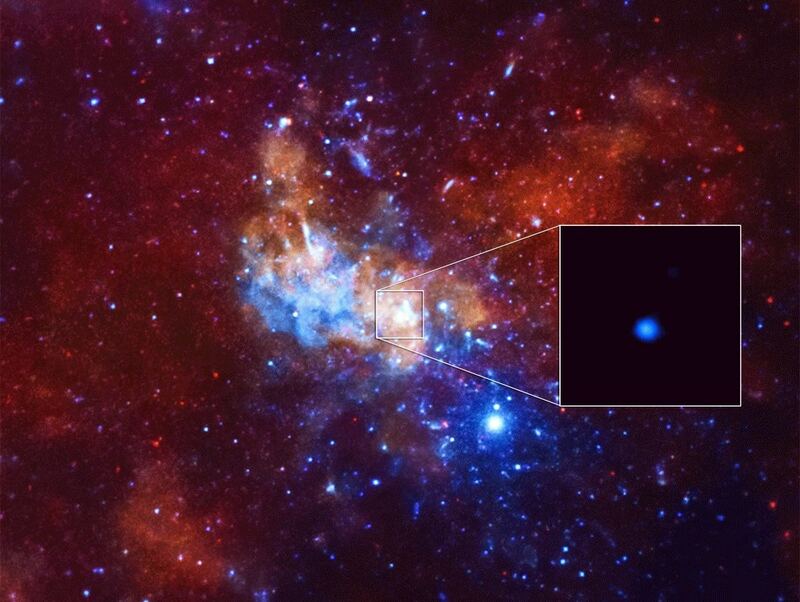 Sagittarius A*. While their exact cause is still the subject of debate, the orbits of HVSs can be calculated since they are completely determined by the gravitational field of the galaxy. As they explain in their study, the researchers used the asymmetry in the radial velocity distribution of stars in the galactic halo to determine the galaxy’s gravitational potential. The velocity of these halo stars is dependent on the potential escape speed of HVSs, provided that the time it takes for the HVSs to complete a single orbit is shorter than the lifetime of the halo stars. From this, they were able to discriminate between different models for the Milky Way and the gravitational force it exerts. By adopting the nominal travel time of these observed HVSs – which they calculated to about 330 million years, about the same as the average lifetime of halo stars – they were able to derive gravitational estimates for the Milky Way which allowed for estimates on its overall mass. “By calibrating the minimum speed of unbound stars, we find that the Milky Way mass is in the range of 1.2-1.9 trillions solar masses,” said Loeb. While still subject to a range, this latest estimate is a significant improvement over previous estimates. What’s more, these estimates are consistent our current cosmological models that attempt to account for all visible matter in the Universe, as well as dark matter and dark energy – the Lambda-CDM model. Based on this breakdown, it can be said that normal matter in our galaxy – i.e. stars, planets, dust and gas – accounts for between 240 and 380 billion Solar Masses. So not only does this latest study provide more precise mass constraints for our galaxy, it could also help us to determine exactly how many star systems are out there – current estimates say that the Milky Way has between 200 to 400 billion stars and 100 billion planets. Beyond that, this study is also significant to the study of cosmic formation and evolution. By placing more precise estimates on our galaxy’s mass, ones which are consistent with the current breakdown of normal matter and dark matter, cosmologists will be able to construct more accurate accounts of how our Universe came to be. One step clsoer to understanding the Universe on the grandest of scales! Ultraviolet light is what you might call a controversial type of radiation. On the one hand, overexposure can lead to sunburn, an increased risk of skin cancer, and damage to a person’s eyesight and immune system. On the other hand, it also has some tremendous health benefits, which includes promoting stress relief and stimulating the body’s natural production of vitamin D, seratonin, and melanin. And according to a new study from a team from Harvard University and the Harvard-Smithsonian Center for Astrophysics (CfA), ultraviolet radiation may even have played a critical role in the emergence of life here on Earth. As such, determining how much UV radiation is produced by other types of stars could be one of the keys to finding evidence of life any planets that orbit them. The study, titled “The Surface UV Environment on Planets Orbiting M Dwarfs: Implications for Prebiotic Chemistry and the Need for Experimental Follow-up“, recently appeared in The Astrophysical Journal. Led by Sukrit Ranjan, a visiting postdoctoral researcher at the CfA, the team focused on M-type (red dwarf) stars to determine if this class of star produces enough UV radiation to kick-start the biological processes necessary for life to emerge. Recent studies have indicated that UV radiation may be necessary for the formation of ribonucleic acid (RNA), which is necessary for all forms of life as we know it. And given the rate at which rocky planets have been discovered around red dwarf stars of late (exampled include Proxima b, LHS 1140b, and the seven planets of the TRAPPIST-1 system), how much UV radiation red dwarfs give off could be central to determining exoplanet habitability. For the sake of their study, the team created radiative transfer models of red dwarf stars. They then sought to determine if the UV environment on prebiotic Earth-analog planets which orbited them would be sufficient to stimulate the photoprocesses that would lead to the formation of RNA. From this, they calculated that planets orbiting M-dwarf stars would have access to 100–1000 times less bioactive UV radiation than a young Earth. As a result, the chemistry that depends on UV light to turn chemical elements and prebiotic conditions into biological organisms would likely shut down. Alternately, the team estimated that even if this chemistry was able to proceed under a diminished level of UV radiation, it would operate at a much slower rate than it did on Earth billions of years ago. Previous studies have shown that even calm red dwarfs experience dramatic flares that periodically bombard their planets with bursts UV energy. While this was considered to be something hazardous, which could strip orbiting planets of their atmospheres and irradiate life, it is possible that such flares could compensate for the lower levels of UV being steadily produced by the star. This news also comes on the heels of a study that indicated how the outer planets of the TRAPPIST-1 system (including the three located within its habitable zone) might still have plenty of water of their surfaces. Here too, the key was UV radiation, where the team responsible for the study monitored the TRAPPIST-1 planets for signs of hydrogen loss from their atmospheres (a sign of photodissociation). This research also calls to mind a recent study led by Professor Avi Loeb, the Chair of the astronomy department at Harvard University, Director of the Institute for Theory and Computation, and also a member of the CfA. Titled, “Relative Likelihood for Life as a Function of Cosmic Time“, Loeb and his team concluded that red dwarf stars are the most likely to give rise to life because of their low mass and extreme longevity. Compared to higher-mass stars that have shorter life spans, red dwarf stars are likely to remain in their main sequence for as long as six to twelve trillion years. Hence, red dwarf stars would certainly be around long enough to accommodate even a vastly decelerated rate of organic evolution. In this respect, this latest study might even be considered a possible resolution for the Fermi Paradox – Where are all the aliens? They’re still evolving! As always, scientists are forced to work with a limited frame of reference when it comes to assessing the habitability of other planets. To our knowledge, life exists on only on planet (i.e. Earth), which naturally influences our understanding of where and under what conditions life can thrive. And despite ongoing research, the question of how life emerged on Earth is still something of a mystery. 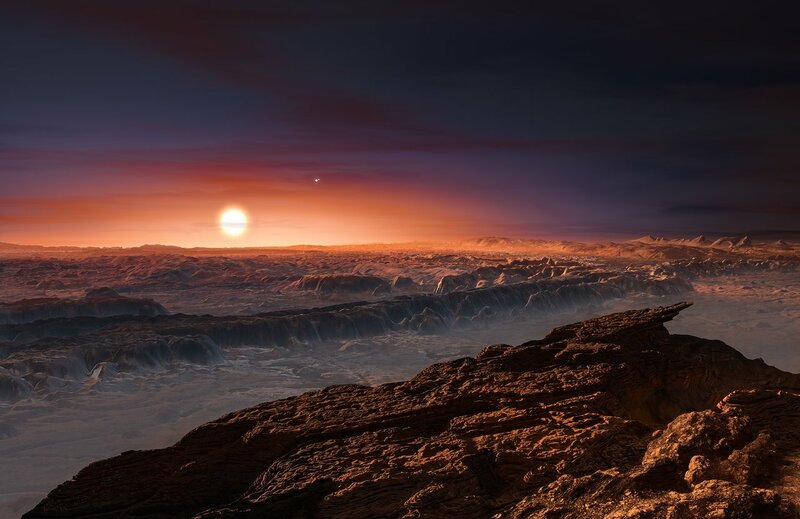 If life should be found on a planet orbiting a red dwarf, or in extreme environments we thought were uninhabitable, it would suggest that life can emerge and evolve in conditions that are very different from those of Earth. In the coming years, next-generation missions like the James Webb Space Telescope are the Giant Magellan Telescope are expected to reveal more about distant stars and their systems of planets. The payoff of this research is likely to include new insights into where life can emerge and the conditions under which it can thrive. 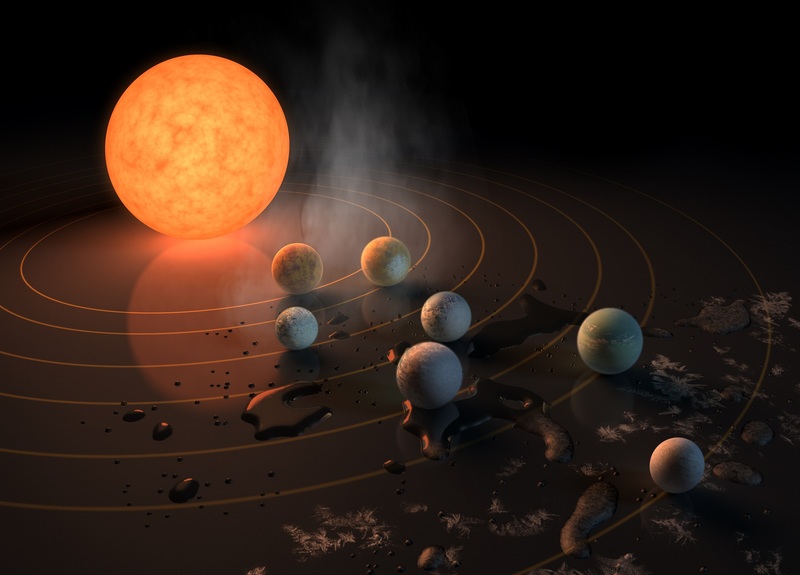 Ever since scientists confirmed the existence of seven terrestrial planets orbiting TRAPPIST-1, this system has been a focal point of interest for astronomers. Given its proximity to Earth (just 39.5 light-years light-years away), and the fact that three of its planets orbit within the star’s “Goldilocks Zone“, this system has been an ideal location for learning more about the potential habitability of red dwarf stars systems. This is especially important since the majority of stars in our galaxy are red dwarfs (aka. M-type dwarf stars). Unfortunately, not all of the research has been reassuring. For example, two recent studies performed by two separate teams from Harvard-Smithsonian Center for Astrophysics (CfA) indicate that the odds finding life in this system are less likely than generally thought. The first study, titled “Physical Constraints on the Likelihood of Life on Exoplanets“, sought to address how radiation and stellar wind would affect any planets located within TRAPPIST-1s habitable zone. Towards this end, the study’s authors – Professors Manasvi Lingam and Avi Loeb – constructed a model that considered how certain factors would affect conditions on the surface of these planets. Essentially, Dr. Lingam and Dr, Loeb found that planets in the TRAPPIST-1 system would be barraged by UV radiation with an intensity far greater than that experienced by Earth. This is a well-known hazard when it comes to red dwarf stars, which are variable and unstable when compared to our own Sun. They concluded that compared to Earth, the chances of complex life existing on planets within TRAPPIST-1’s habitable zone were less than 1%. The second study – “The Threatening Environment of the TRAPPIST-1 Planets“, which was recently published in The Astrophysical Journal Letters – was produced by a team from the CfA and the Lowell Center for Space Science and Technology at the University of Massachusetts. Led by Dr. Cecilia Garraffo of the CfA, the team considered another potential threat to life in this system. Essentially, the team found that TRAPPIST-1, like our Sun, sends streams of charged particles outwards into space – i.e. stellar wind. Within the Solar System, this wind exerts force on the planets and can have the effect of stripping away their atmospheres. Whereas Earth’s atmosphere is protected by its magnetic field, planets like Mars are not – hence why it lost the majority of its atmosphere to space over the course of hundreds of million of years. As the research team found, when it comes to TRAPPIST-1, this stream exerts a force on its planets that is between 1,000 to 100,000 times greater than what Earth experiences from solar wind. Furthermore, they argue that TRAPPIST-1’s magnetic field is likely connected to the magnetic fields of the planets that orbit around it, which would allow particles from the star to directly flow onto the planet’s atmosphere. As you can imagine, this is not exactly good news for those who were hoping that the TRAPPIST-1 system would hold the first evidence of life beyond our Solar System. Between the fact that its planets orbit a star that emits varying degrees of intense radiation, and the proximity its seven planets have to the star itself, the odds of life emerging on any planet within it’s “habitable zone” are not significant. The findings of the second study are particularly significant in light of other recent studies. In the past, Prof. Loeb and a team from the University of Chicago have both addressed the possibility that the TRAPPIST-1 system’s seven planets – which are relatively close together – are well-suited to lithopanspermia. In short, they determined that given their close proximity to each other, bacteria could be transferred from one planet to the next via asteroids. But if the proximity of these planets also means that they are unlikely to retain their atmospheres in the face of stellar wind, the likelihood of lithopanspermia may be a moot point. However, before anyone gets to thinking that this is bad news as far as the hunt for life goes, it is important to note that this study does not rule out the possibility of life emerging in all red dwarf star systems. If there is one takeaway from these studies, it is that the existence of life within a star system does not simply require planets orbiting within the circumstellar habitable zones. The nature of the stars themselves and the role played by solar wind and magnetic fields also have to be taken into account, since they can mean the difference between a life-bearing planet and a sterile ball of rock! Further Reading: CfA, International Journal of Astrobiology, The Astrophysical Journal Letters . For us Earthlings, life under a single Sun is just the way it is. But with the development of modern astronomy, we’ve become aware of the fact that the Universe is filled with binary and even triple star systems. Hence, if life does exist on planets beyond our Solar System, much of it could be accustomed to growing up under two or even three suns. For centuries, astronomers have wondered why this difference exists and how star systems came to be. Whereas some astronomers argue that individual stars formed and acquired companions over time, others have suggested that systems began with multiple stars and lost their companions over time. According to a new study by a team from UC Berkeley and the Harvard-Smithsonian Center for Astrophysics (CfA), it appears that the Solar System (and other Sun-like stars) may have started out as binary system billions of years ago. This study, titled “Embedded Binaries and Their Dense Cores“, was recently accepted for publication in the Monthly Notices of the Royal Astronomical Society. In it, Sarah I. Sadavoy – a radio astronomer from the Max Planck Institute for Astronomy and the CfA – and Steven W. Stahler (a theoretical physicist from UC Berkeley) explain how a radio surveys of a star nursery led them to conclude that most Sun-like stars began as binaries. They began by examining the results of the first radio survey of the giant molecular cloud located about 600 light-years from Earth in the Perseus constellation – aka. the Perseus Molecular Cloud. This survey, known as the VLA/ALMA Nascent Disk and Multiplicity (VANDAM) survey, relied the Very Large Array in New Mexico and the Atacama Large Millimeter/submillimeter Array (ALMA) in Chile to conduct the first survey of the young stars (<4 million years old) in this star-forming region. For several decades, astronomers have known that stars are born inside “stellar nurseries”, which are the dense cores that exist within immense clouds of dust and cold, molecular hydrogen. These clouds look like holes in the star field when viewed through an optical telescope, thanks to all the dust grains that obscure light coming from the stars forming within them and from background stars. Radio surveys are the only way to probe these star-forming regions, since the dust grains emit radio transmissions and also do not block them. For years, Stahler has been attempting to get radio astronomers to examine molecular clouds in the hope of gathering information on the formation of young stars inside them. To this end, he approached Sarah Sadavoy – a member of the VANDAM team – and proposed a collaboration. Their observations of the Perseus cloud revealed a series of Class 0 and Class I stars – those that are <500,000 old and 500,000 to 1 million years old, respectively – that were surrounded by egg-shaped cocoons. These observations were then combined with the results from VANDAM and other surveys of star forming regions – including the Gould Belt Survey and data gathered by SCUBA-2 instrument on the James Clerk Maxwell Telescope in Hawaii. From this, they created a census of stars within the Perseus cloud, which included 55 young stars in 24 multiple-star systems (all but five of them binary) and 45 single-star systems. What they observed was that all of the widely separated binary systems – separated by more than 500 AU – were very young systems containing two Class 0 stars that tended to be aligned with the long axis of their egg-shaped dense cores. Meanwhile, the slightly older Class I binary stars were closer together (separated by about 200 AU) and did not have the same tendency as far as their alignment was concerned. From this, the study’s authors began mathematically modelling multiple scenarios to explain this distribution, and concluded that all stars with masses comparable to our Sun start off as wide Class 0 binaries. They further concluded that 60% of these split up over time while the rest shrink to form tight binaries. This new data could also be the start of a new trend, where astronomers rely on radio telescopes to examine dense star-forming regions with the hopes of witnessing more in the way of stellar formations. With the recent upgrades to the VLA and the Atacama Large Millimeter/submillimeter Array (ALMA) in Chile, and the ongoing data provided by the SCUBA-2 survey in Hawaii, these studies may be coming sooner other than later. Another interesting implication of the study has to do with something known as the “Nemesis hypothesis”. In the past, astronomers have conjectured that a companion star named “Nemesis” existed within our Solar System. This star was so-named because the theory held that it was responsible for kicking the asteroid which caused the extinction of the dinosaurs into Earth’s orbit. Alas, all attempts to find Nemesis ended in failure. So while their results do not point towards a star being around for the extinction of the dinosaurs, it is possible (and even highly plausible) that billions of years ago, the Solar planets orbited around two stars. One can only imagine what implications this could have for the early history of the Solar System and how it might have affected planetary formation. But that will be the subject of future studies, no doubt!